BlackHalo is the only program in the world to offer revolutionary unbreakable contracts! This allows you to agree on literally anything and know the other party will honor their word. By using double deposit, theft is now impossible. No escrow is needed, no middlemen or websites holding on to funds. Read the whitepaper and documentation for more details. We also feature the worlds first truly decentralized marketplace! Its totally FREE. No fees, no arbiters, no chargebacks. Trade internationally with anyone. Its like a combination of E-Bay, Alibaba and Freelancer! There are no servers and no bloat. There is no limit to what you can do here. An entire economy exists inside the software. The software can switch from Bitcoin to Blackcoin with the click of a button. USD integration allows you to pay in exact dollar amounts by synchronizing with exchange rates. The same keys are used for both coins! Very user friendly making crypto fun and easy to use. Learn cryptocurrency even if you are new to it. Finally anyone in the world has access to cryptocurrency. Halo allows for unbreakable wires and western unions! There are unlimited funding options. No more meeting in person, no more uncertainty, no more websites. Everything is handled peer to peer. Theft is impossible thanks to the contracts. No escrow is needed, the funds are always safe in your hands. The employee must perform, and the employer must pay. Perhaps the most powerful use case of all is the ability to hire knowing the work must get done. Now people must be honest about credentials and not pad their hours! Absolutely perfect for outsourcing! As an employee you can be confident you will get paid. Time extensions allow for long term contracts. Every account uses two keys! Your account is unhackable especially if two locations are used(2FA). Hide your keys inside of images making them impossible to find. Sign transactions from two locations at once. All of this is automated in the software. Give each key a different password! Security on a whole new level. Completely automated joint account creation allows you to form any type of partnership you wish. Share an account with a partner, spouse or friend. Approve all payments together. Advanced sending options for paying simultaneous addresses. Trade gold for silver, corn for rice, sheep for cattle. On the bridge of the unbreakable contracts, delivery times can be on different dates because contracts must be honored. Long term agreements can form a bridge. Create a community farm co-op! Return the world to simpler times and save money doing it. Halo has two options for messaging and both are very effective and private. We use Bitmessage to give all peers a way to communicate without a server. You may also use your Gmail, Hotmail or email account to receive orders from the market and negotiate. Everything is automated for you. Sending cryptocurrency should be easy! So we have given people the option to pay through email. Send to anyone even if they don’t have crypto currency! A powerful feature for adoption. Be part of the tipping craze and send your friends a small tip to get them excited about crypto. You can even password protect your payment. No server holds the funds, its completely secure. The main markets can be kept clean thanks to peer to peer voluntary moderation. Although it is decentralized, we want the masses to love and be part of the movement so we have created an identity system with moderation keys and reputation profiles. One of the main gripes with having to stake your coins is that you have to unlock your wallet in order to do so. Using a variation on Two Step Send, you can synchronize computers from separate locations. This makes your wallet able to stake — while not always remaining online. Allowing for a more secure option to staking — especially for a large amount of coins. Halo features “user friendly templates” such as Cash For Coins, Buy/Sell Anything, Barter, Python Contracts and Custom Contracts. These allow full automation of all of the services you can provide in Halo. Anyone even if not familiar with coins, will be able to use and understand the system. A built in price tracker keeps your orders stable. The worlds first fully decentralized exchange. No middle coins, no websites, nobody touches your funds except for you. Centralized exchanges are notoriously known for taking users funds totally disrupting the trust people place in this wonderful technology. That day is going to be at an end. 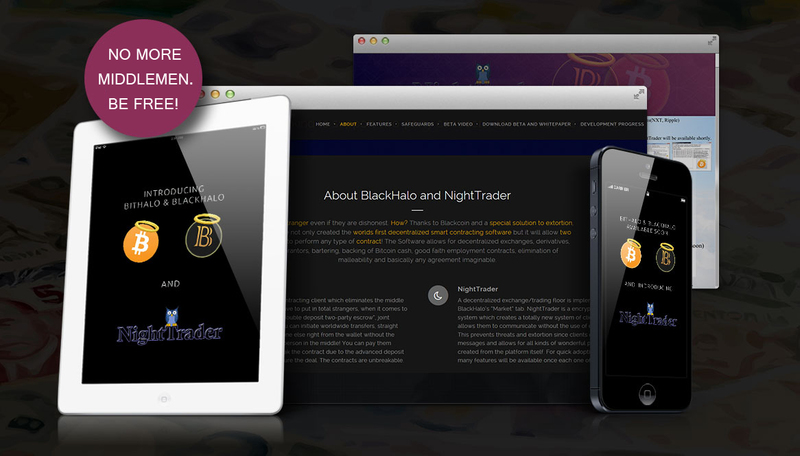 NightTrader is a protocol in BlackHalo for microtrading. Anyone can microtrade with the deposits are the insurance. Halo does smart contracts of any kind. However to enhance the automation of these contracts we can allow for peers to agree on and execute Python code. Therefore, there is absolutely no limit to how complex you can make a smart contract! Unlike Etherium, this won’t bloat the blockchain and could scale indefinitely. Also, there is no need for protocol changes with new contract ideas! Perfect for derivatives and checking spot prices online. Revolutionary change is coming to crypto-currency in the Halo platform. We are working on a currency called BitBay that has the ability to inflate and deflate. Interest rates are controlled by votes and algorithms and thus, users can grow their own coin in a stable fashion ending the era of the infamous “pump and dump”. You will be able to use objects similar to bonds, perform advanced contracts and be your own bank. For Blackcoin, this sister currency will be a stable hedge adding health to the economy. Halo supports basic notary with notifications and the ability to prove ownership of any document. This is a very useful tool in real world situations that still need valid paper contracts. In addition to your smart contract, this service can be immensely powerful. The first of its kind to support two-party contracts, Joint Accounts & More! Trust a stranger even if they are dishonest. How? to perform any type of contract! The Software allows for decentralized exchanges, derivatives, guarantors, bartering, backing of Bitcoin cash, good faith employment contracts, elimination of malleability and basically any agreement imaginable. BlackHalo is a smart contracting client which eliminates the middle man, or the trust you have to put in total stranger when doing transactions. It offers “double deposit two-party escrow”, joint accounts and more! You can initiate worldwide transfers, straight from your computer to someone else right from the wallet — anywhere in the world and without the need of a company or person acting as an intermediary. You can pay them knowing they can’t break the contract due to the advanced deposit each party made to insure the deal. Released on July 4th, 2014. A decentralized exchange/trading system is implemented in BlackHalo’s “Market” tab. NightTrader is a microtrading protocol which allows you to trade any two assets without the risk of loss. Python contracts can automate the process for you and finally relieve the world of dependence on centralized exchanges that are highly prone to loss. BlackHalo is a business protocol that solves a problem about commitment schemes and trustless two-party double-deposit escrow! BlackHalo allows you to safely trade or barter coins or other commodities however you like. The software has several safeguards to assure you are fully protected. BlackHalo confirms the escrow is properly signed before proceeding. It will alert you that everything is confirmed. Once it does, you are free to make the exchange. BlackHalo creates an advanced timeout transaction that destroys the escrow once the time expires. Therefore dishonest parties can not profit and must honor their agreement. Instant refunds are a simple way to circumvent transaction malleability. With this feature in place advanced commitments are made. Any broken transaction IDs will automatically be re-signed by the client. This may happen if a group of miners mutate transactions. Micro-trading allows parties to structure their trust in increments. So for parties that wish to risk less in the beginning, can still trade for large amounts. They can perform trust building exercises with new parties. In Halo markets, we have built a decentralized reputation system. The system is based on perspective and what you see users doing. Reviews can be left and proof of successful escrows can be verified. There is also a peer to peer voluntary moderation layer to keep the main markets clean. The auto-backup function automatically saves all your contract data at a second location. While BlackHalo already stores this, this feature stores the entire history off all your contracts just in case a mistake is made. BlackHalo has the potential to be a game changer for the world of Crypto as we know it. No longer do you have to worry about your favorite Bitcoin exchange being closed down or the person in charge running away with their pockets full of your money. Don’t tell Darkcoin… Trading across chains is more anonymous than any other coin.? Current estimated development stage. Just a quick overview.